Beautifully engraved Certificate from the famous Kentucky Harness Racing Associationissued in 1959. This historic document has an ornate border around it with the company's name in fancy scroll. This item is hand signed by the associations's president and is over 41 years old. 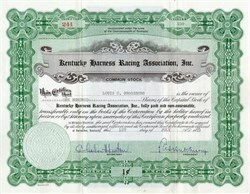 The General Assembly established a State Racing Commission in 1906. The Kentucky State Racing Commission was created in 1960 to regulate thoroughbred racing and the conduct of pari-mutuel wagering on thoroughbred racing. In 1992, the General Assembly abolished the Kentucky State Racing Commission and the Kentucky Harness Racing Commission and created the Kentucky Racing Commission (KRS Chapter 230). The Commission is composed of eleven commissioners and an Executive Director, each of whom is appointed by the Governor. What is Harness Racing? Harness Racing Horses - The Standardbred Horse The term "Standardbred" originates from a standard set in 1879 by the National Association of Trotting Horse Breeders in America. For inclusion in the official register of the new breed, a horse was required to cover a mile (1609metres) in the standard of 2 mins and 30 seconds or better. As the nickname implies, harness horses do not gallop, they trot or pace. Horses which gallop must be quickly restrained, or they will be disqualified. Horses will usually only gallop if checked, unsettled or under a pressure, hence harness horses must have great mental ability as well as physical strength. Trotting is the natural gait for horses and most other animals - indeed when you crawl, you are in the same gait as a trot - with diagonally opposite legs moving simultaneously (ie, the legs on one side of the body move in an "in-out" fashion). As it is their natual gait, trotters generally wear little 'gear' to keep them in gait, and hence they are likely to gallop if unsettled or checked. The ability to trot consistantly throughout races is a highly sought after attribute in such horses. Trotting is the slightly slower gait. The track record at Moonee Valley for a mile (1609m) is 1 min 55.6secs, set by Scotch Notch on time trial in 1985. The fastest race mile is held by Sundons Way NZ in 1:58:0 13/2/99. Pacing is the non-natural gait for horses, and is bred and trained into the horses, which in turn wear a variety of "gear" to prevent them from over-extending and galloping. Cats, camels and giraffe's are the only animals to pace naturally. In this gait, the legs on one side of the body move forward OR backward simultaneously. Pacing is the faster, and higher money earning version of the sport. Harness Racing - the Format Harness Races generally involve up to 14 trotters or pacers racing on oval-shaped, shellgrit surfaced tracks. Nearly all races are in the anti-clockwise direction, a notable exception is Auckland's Alexandra Park. Harness Races may begin with either a Standing Start (SS), or Mobile Start(MS). In Standing Start races, runners stand behind elastic tapes which are stretched across the track, and then released to start the race. This method is used to hold handicap races. In harness racing, horses are not handicapped by carrying weight (as gallopers are) - they are handicapped by having to start some distance behind the correct release point, hence the handicapped horses run more distance. Horses are more likely to gallop away from standing starts, and hence must be on their best behaviour to settle into their gait quickly. In Mobile starts, horses trot/pace slowly behind a moving vehicle which has gates fitted. When in the starting position, these gates reach across the track to the other, which is 8 horses wide at Moonee Valley. Horses line up behind the gate, and upon reaching release point, the vehicle (referred to as "the mobile") accelerates away and the gates fold back, allowing the race to begin. ....the arms fold back, and they're racing! Harness Racing the World Over Harness Racing is popular around the world, particularly Europe, North America, Australia and New Zealand. Both types of horse are raced in Australia, from Mobile and Standing Starts. Europe races trotters only, wheras America races both, with a ratio of 5 pacers:1 trotter. In Australia and Europe races are held over a variety of distances, North America races over one mile (1609 metres) only.